Jeb Bush Praises President Donald Trump’s ‘Gracious’ Response After Death of Bush Sr.
Former Florida Gov. Jeb Bush, who ran against President Donald Trump in the 2016 Republican primary, said that Trump “couldn’t have been nicer” following George H.W. Bush’s death. Bush said at the Wall Street Journal CEO Council’s annual meeting in Washington that President Trump called him after his father, the 41st president of the United States, passed away on Nov. 30. He added that Trump and First Lady Melania Trump have been “really gracious,” noting that the first lady gave former first lady Laura Bush and 19 other Bush family members a tour at the White House on Monday. Jeb Bush’s granddaughters were on the tour. 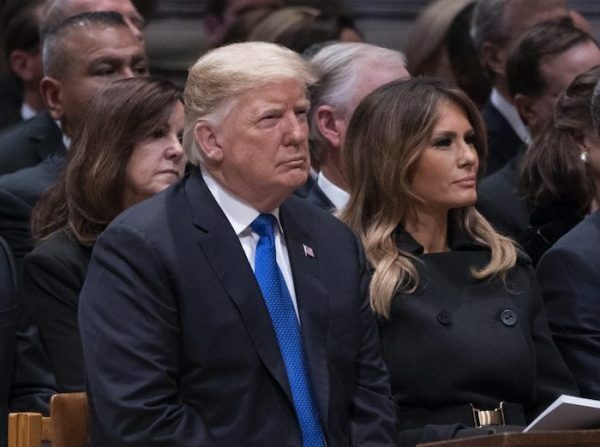 The Trumps also visited with George W. Bush and Laura Bush at the Blair House, and the president previously sent Air Force One to transport Bush’s body in a show of support for his family. Jeb Bush also explained why the president wouldn’t be giving a eulogy at his father’s state funeral at the National Cathedral on Dec. 5. “What people want to talk about is, Well, why isn’t the president giving the eulogy?’ It’s because we have a unique circumstance here my brother was president,” he said. 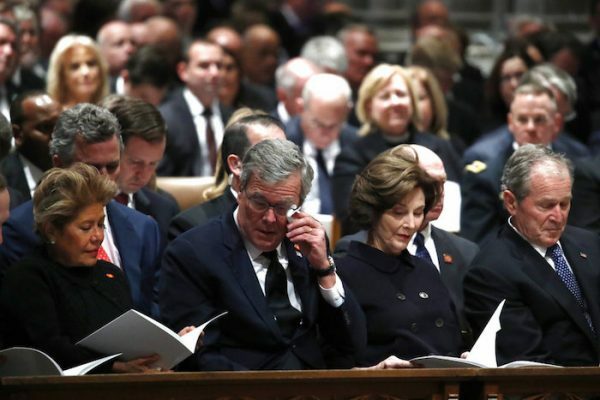 Former president George W. Bush delivered an emotional eulogy to his father at the funeral on Wednesday afternoon. President Trump and his wife attended along with Barack Obama, Bill Clinton, Jimmy Carter, and their wives. They sat in the front row, with Trump on the right, then the Obamas, the Clintons, and Carter, who is the oldest living president at 94. Trump declared Dec. 5 a national holiday in honor of Bush’s work as president and his service in the armed forces. “President Bush always found a way to set the bar higher. As a young man, he captained the Yale baseball team and served as the youngest aviator in the United States Navy during the Second World War. Later in life, he rose to the pinnacle of American politics as a Congressman from Texas, envoy to China, Director of Central Intelligence, Vice President of eight years to President Ronald Reagan, and finally President of the United States,” they added. Trump sent a message to Congress on Dec. 3, praising Bush further, noting Bush’s service in the U.S. Navy during World War Two. Bush flew 58 combat missions during the war. After the war, he served in a number of roles, including the ambassador to the United Nations, before becoming president. “Resolute through war, President Bush was magnanimous in peace. As the communist threat subsided, he stood down America’s nuclear bombers from the alert posture they had maintained for so long and gently encouraged the development of democracy and free markets in the crumbling Soviet Union,” Trump said.